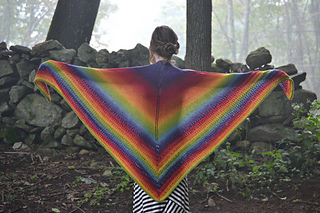 Harry is a simple shawl that shows off self-striping yarn beautifully. 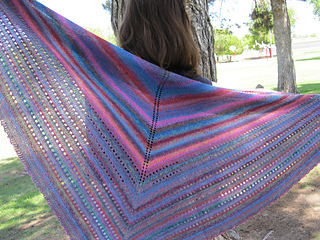 It´s mostly in stockinette stitch with a garter eyelet pattern at the bottom. 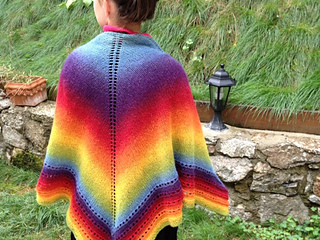 Though the Harry Shawl is similar to other shawls, I´m really proud of it because it´s my first design. Please be gentle on me if you find any mistakes or poor language (I´m Swedish). Don´t hesitate to let me know! You can make Harry in any yarn and size. 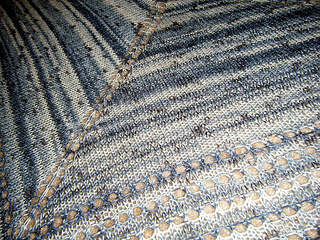 In my version I started to knit the eyelet rows when there were 55 holes made from the yarn overs on each side of the center stitch. 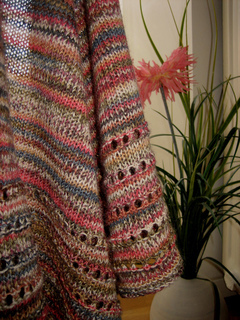 To use only one skein I think you have to begin to knit the eyelets when you´ve made about 40 holes. 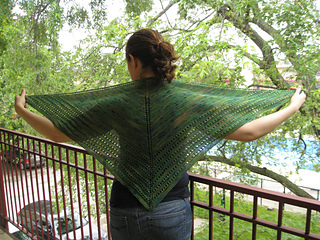 Note: the four increases per knit row continue after the eyelet section begins. Thanks to mawieva there is now a Spanish translation. You can also download a Swedish translation. 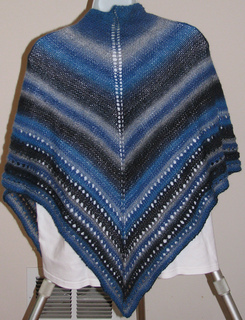 Errata: Before you bind off you should knit 5 rows of garter stitch, not 3. Afterthought: If I were to do this again, I would substitute the YO’s around the center stitch in the stockinette part with M1L and M1R.